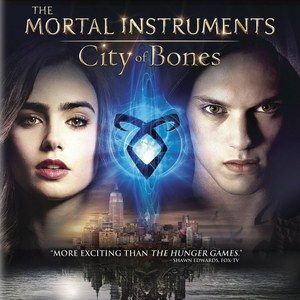 Sony Pictures Home Entertainment invites viewers to discover a spectacular world hidden within our own when The Mortal Instruments: City of Bones debuts on Blu-ray combo pack & DVD on Dec. 3. Based on Cassandra Clare's best-selling book series, which sold more than 24 million copies worldwide, this supernatural action-adventure stars Lily Collins (Mirror Mirror, The Blind Side) as Clary Fray, a seemingly ordinary teenager who discovers she is the descendant of a line of "Shadowhunters," also known as half-angel warriors locked in an ancient battle to protect our world from demons. Directed by Harald Zwart (The Karate Kid) and co-starring Jamie Campbell Bower (Twilight, Harry Potter series), Lena Headey (The Purge, TV's Game of Thrones) and Jonathan Rhys Meyers (TV's The Tudors), The Mortal Instruments: City of Bones is packed with otherworldly action and romance for both new fans and fans of the "Mortal Instruments" book series. The Mortal Instruments: City of Bones Blu-ray combo pack includes deleted scenes, an interactive lineage tracker that allows fans to delve deeper into the characters in The Mortal Instruments, the "Almost is Never Enough" Music Video by Ariana Grande featuring Nathan Sykes, and five behind-the-scenes featurettes exploring the exciting journey of bringing this No. 1 New York Times best-selling book to dazzling life on screen. Synopsis: Based on the best-selling book series, a seemingly ordinary teenager, Clary Fray (Collins), discovers she is the descendant of a line of Shadowhunters, a secret cadre of young half-angel warriors locked in an ancient battle to protect our world from demons. After the disappearance of her mother (Headey), Clary must join forces with a group of Shadowhunters who introduce her to a dangerous alternate New York called Downworld filled with demons, warlocks, vampires, werewolves and other deadly creatures. The Mortal Instruments: City of Bones was written by Jessica Postigo Paquette (upcoming Tarzan) and is based on the novel by Cassandra Clare. It was produced by Don Carmody (Silent Hill: Revelation 3D, Resident Evil: Retribution) and Robert Kulzer (The Three Musketeers, Resident Evil: Afterlife). Executive producers are Bob Shayne (The Lord of the Rings series), Michael Lynne (The Lord of the Rings series) and Martin Moszkowicz (Resident Evil: Retribution). Co-Executive producer is Veslemøy Ruud Zwart (Agent Cody Banks). The film has a run time of approximately 130 minutes and is rated PG-13 for intense sequences of fantasy violence and action, and some suggestive content.